Advantages: Older kit brought up to more modern standards with "slide molded" parts, brass and "Magic Track"
Dragon has now started to issue its new "Premium Edition"kits, which are essentially older kits that have been improved by the addition of new sprues from other, newer kits as well as the addition of some of the accessories created for those same new kits along the way, such as etched brass and turned aluminum barrels. Armor kits also tend to get either "EZ Track" or "Magic Track"; the former are off-the-sprues parts ready to assemble, and the latter are snap-together tracks to speed assembly. The DML Tiger II with Porsche turret is about three years old, but has now received the "Premium" treatment with the addition of these accessories. The base kit uses the latest edition of the primary parts (e.g. hull, wheels and most details) with the Porsche turret and a slew of accessories. First off, the kit now comes with "Magic Track" links – 120 "A" links and 120 "B" links – for snap-together assembly. This will make many modelers happy as preparing and assembling single-link track can be quite tedious. Secondly, many detail parts have been replaced with the new standarized DML "T" series generic German tool and equipment sprues. The ones provided are as follows: TA - pioneer tools and a fire extinguisher; TB - jack and cable hooks; TC -tow cable heads; TD - auxiliary cable heads; TF - 8.8 cm muzzle brake for aluminum barrel; TG - self-defense projector weapon; TH - hatch braces; TJ - turret AA MG ring mount; TK - bow machine gun mount; TL - armored exhaust covers. These apparently will be provided with different kits as need be, but are all state of the art slide moldings where applicable. Third, the model comes with a large sheet of etched brass for the screens and brackets used on the tank. And lastly, it comes with some metal accesories, such as towing clevises, a whip antenna, a section of chain, two metal tow cables, and a turned aluminum barrel. The directions are unfortunately the color photo variety, which from my point of view makes applying the etched brass parts difficult as it is hard to see them in the photos of a partially finished model with "Stick here" arrows. I have seen a new method used by DML in which colors are used for the various parts with black and white drawings, and when you have a ton of etched brass parts this is easier to read than the color directions which offer little – if any – help. That's a shame as it lets a very nice kit with great accessories down. There are also a lot of odd things about the kit. For example, the kit comes with a very nice bow MG-34 (sprue J) but there is none for the nicely done AA mount. The main problem most modelers will have is that alas, it does not come with the "zimmerit" paste coating found on nearly all of the Porsche-turreted tanks, even though the finishing directions show it and indicate it is required. Finishing instructions and decals are provided for five vehicles: 3./s.Pz.Abt. 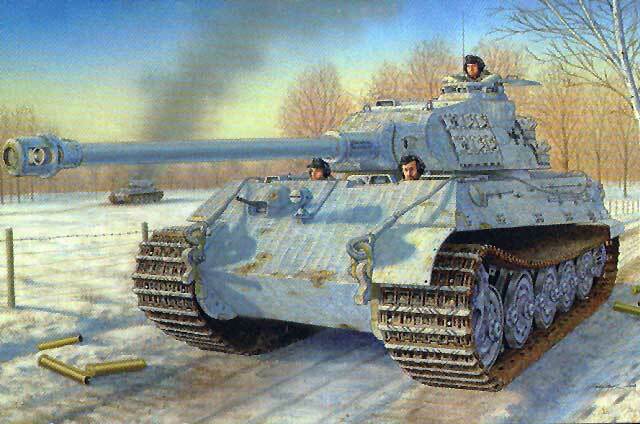 503 in Hungary, 1945 (winter white); s/Pz.Kp. (Fkl) 316, France 1944 (overall Panzerbraun); s.Pz.Abt. 506, Arnhem 1944 (green over Panzerbraun); Unidentified, Eastern Front 1944 (tricolor); and s.Pz.Abt. 503, Normandy 1944 (tricolor). Decals are "targeted" on the single sheet. Overall this is a nice upgrade to the original kit, but with the advent of DML's provision of "zimmerit" molded on their 1/72 scale line one can only hope that they extend it to their larger kits, too.